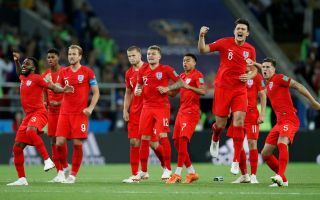 Liverpool legend Phil Thompson believes England defender Harry Maguire would make a fine signing for his old club in this summer’s transfer window. The 25-year-old has been one of the top performers for England at this summer’s World Cup, scoring a thumping header against Sweden to fire Gareth Southgate’s side into their first semi-final since 1990. Maguire shone for Leicester City last season to earn his call up for the national side this summer, and he’s really made the most of his opportunity on the big stage. It’s getting increasingly hard to imagine the Foxes can hold on to Maguire after this, with Liverpool certainly in need of a top centre-back of his calibre. The Reds signed Virgil van Dijk in that position in January but could still do with a player like Maguire as an upgrade on the likes of Dejan Lovren and Joel Matip. Thompson expects the England international would likely cost at least £50million, but hopes his old side will be leading the charge for his signature this summer. ‘Harry has been one of the best defenders in the World Cup and he certainly fits Liverpool’s philosophy. I can’t speak more highly of him,’ Thompson told the Liverpool Echo. ‘No disrespect to Leicester but I can’t see him being there come the end of the transfer window. I think he would have been £50million before the World Cup and probably a bit more now. But I think he would be worth it.